(CNN) -- Germany international striker Mario Gomez has revealed his delight at his propective move to Bayern Munich, revealing that he chose the Bavarian giants despite receiving lucrative offers to move to the English Premier League. Mario Gomez spent six seasons with Stuttgart, helping them lift the Bundesliga title in 2007. The Stuttgart forward will complete his 30 million euros ($41m) transfer, a record between two Bundesliga sides, when the clubs agree on the technicalities of the deal and when he returns from international duty in China with Germany. "It has always been my dream to play for Bayern Munich," Gomez told Press Association Sport. "I saw no need and had no desire to move abroad. "I am moving because I want to take the next step in my career and Bayern are the German club who can hold their own in Europe. "I had offers from Italy, England and Bayern and I only needed two days to decide. Bayern have been interested in me for the last two years, even after I had a bad European Championship, and this is also why I didn't go abroad." 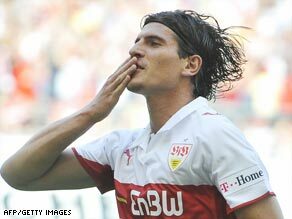 The 23-year-old Gomez has spent six seasons with Stuttgart, helping them to the Bundesliga title in 2007, and has scored 62 goals in 119 games for the club. Howeverm he has often disappointed for the German national team and was heavily criticized for some ineffectual displays during the Euro 2008 finals.